Finally, I can realize my dream of making a floor out of radio tubes! 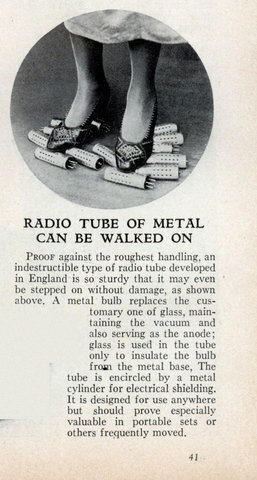 Proof against the roughest handling, an indestructible type of radio tube developed in England is so sturdy that it may even be stepped on without damage, as shown above. A metal bulb replaces the customary one of glass, maintaining the vacuum and also serving as the anode; glass is used in the tube only to insulate the bulb horn the metal base, The tube is encircled by a metal cylinder for electrical shielding. It is designed for use anywhere but should prove especially valuable in portable sets or others frequently moved. Metal tubes are practical and great for RF service; but without that comforting glow they’re about as fun to look at as a transistor. 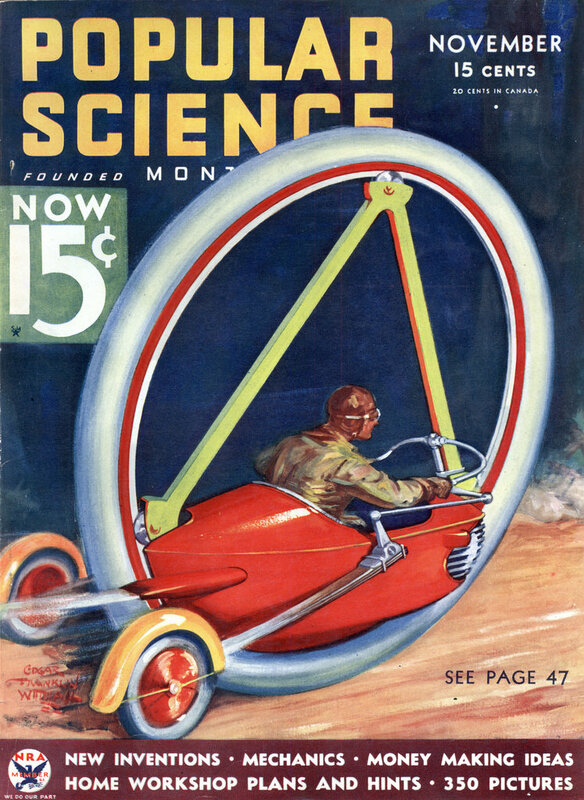 Ah, yes…when men were men and tubes were metal! I must say that developing circuitry with metal-cased tubes was very nice – shielding was built-in to the device, so all you needed to pay attention to was the lead routing under the chassis and your design was very likely to work. They were also really good for mobile work – wouldn’t often break or go bad under vibration the way glass tubes would. Makes me wince at the thought of falling base over apex.